When DeCharlene Williams was looking to buy a building to run her small business out of, she says she was denied loans by 30 different banks. It was almost 50 years ago, in 1968, and they just wouldn’t lend to an African American woman. Williams says she was finally able to secure a loan after applying with her initials instead of her full name. 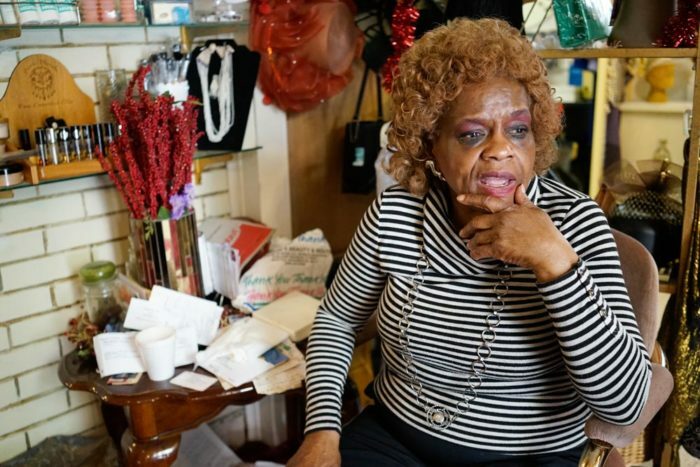 She purchased the one-story brick building at 21st and East Madison in the Central District that’s still home to DeCharlene’s Beauty Shop and Boutique, DeCharlene’s Beauty College, as well as the Central Area Chamber of Commerce office. The awning is painted a bright yellow and green, the windows decorated with pictures of Presidents Barack Obama and Abraham Lincoln, and with flyers announcing community events. After Williams remodeled the building and opened up shop, she steadily built up operations, at one point employing 13 women. 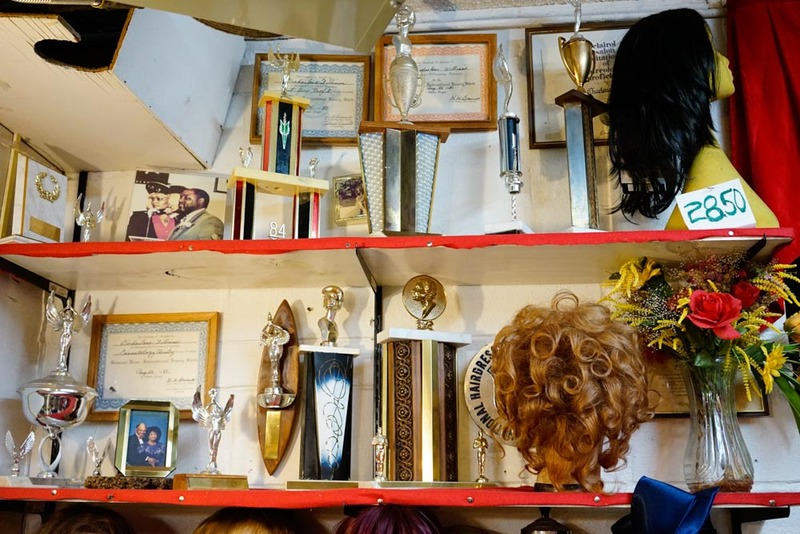 In addition to a vibrantly decorated salon, Williams’ shop is filled with glamorous hats, jewelry, and clothing; the walls lined with framed pictures and awards gathered over the years. A vintage sign reading, “Keep on Pushing With ‘Inward Pride’” hangs above the salon mirrors. But the neighborhood outside DeCharlene’s doors has changed dramatically. 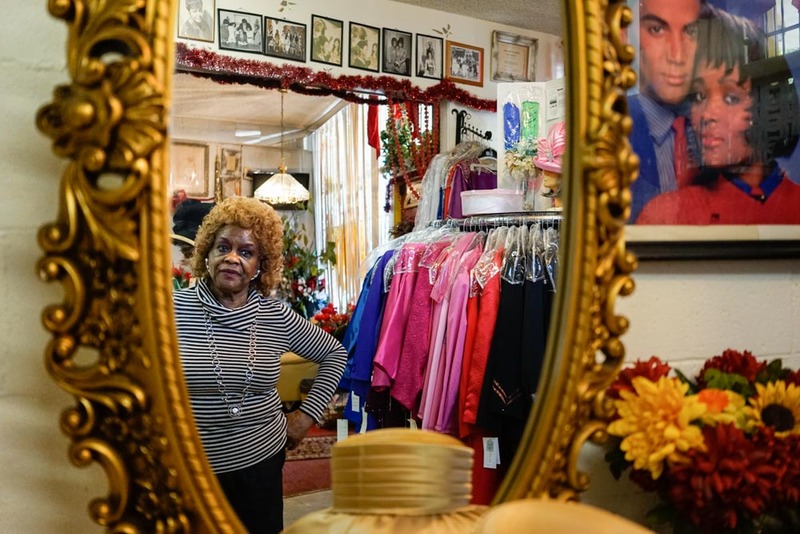 Her businesses appear to be about all that’s left of what used to be a center of Seattle’s Black economy and community along the East Madison corridor. 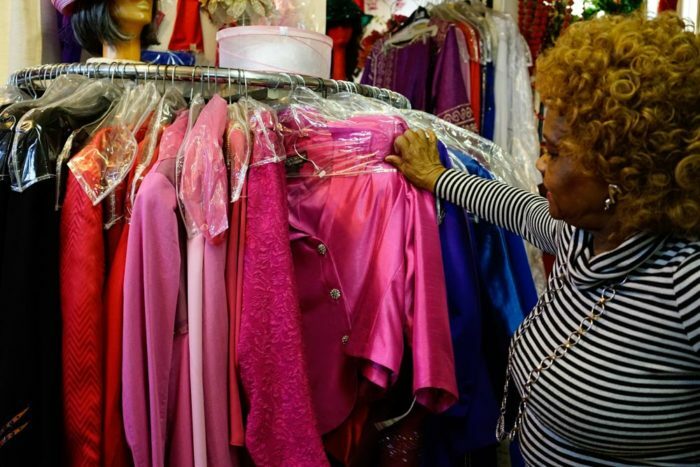 After expanding her boutique to Bellevue for a few years in the ‘70s and joining the Bellevue Chamber Commerce, Williams founded the Central Area Chamber of Commerce in 1983 to encourage business empowerment in her local community. One of Williams’ primary focuses around economic and community development is what she calls “micro-businesses,” typically understood as enterprises with five or fewer employees, or in some cases, no employees other than self-employed owners. Such business are generally limited in loan capital and don’t have much access to the commercial banking sector. 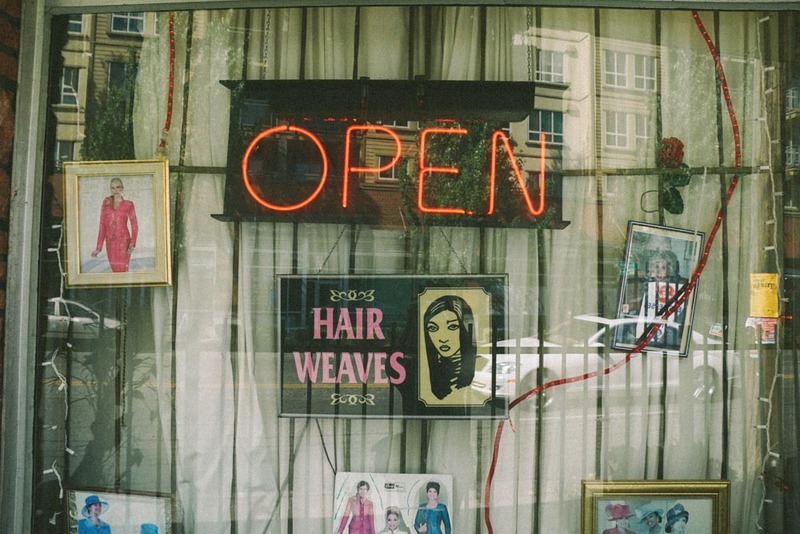 In a neighborhood like the Central District, micro-businesses have traditionally been driven by people of color and immigrants. Williams says rising rents, development, and construction in the area have put the squeeze on small businesses recently. DeCharlene Williams has a remarkable ability to recall names, figures, locations and dates — down to the exact day — spanning over five dynamic decades she’s been a Central District resident, small business owner, and civic leader. She keeps folders, books, and newspaper clippings chronicling happenings in the community. In fact, she’s a local historian of sorts, authoring a book on the history of the Central District in 1990, followed by a second volume in 1996. Self-described as “petite”, yet commanding and seemingly tireless, Williams boasts a long list of accolades, including co-founding the Central Area Youth Association (C.A.Y.A.) in 1965, serving on the Small Business Task Force during Mayor Royer’s administration, and even appearing in “The Nona Tapes” an Alice in Chains spoof rockumentary. Williams made a bid for Mayor in 1993, and for City Council in 1997. Her platform included rent control, job creation, and support for businesses in the Central District. She recalls that, from a very young age, she always held entrepreneurial and creative ambitions. Born in Temple, Texas, Williams moved to Seattle by way of Portland when she was 16, and began her career as a hairdresser in 1961 after graduating from Edwards Beauty School. 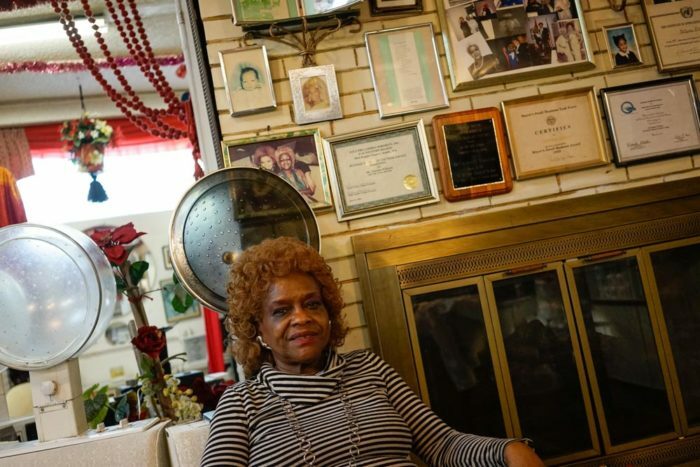 She opened her first salon on 25th and Union in 1965. In 1969, Williams formed a modeling group named Invasions and produced fashion shows featuring the latest trends and hairstyles at venues like the Olympic Hotel. Williams and Invasions also raised over $50,000 for the Seattle Fire Department to purchase the nation’s first Medic One wagon in 1969. Williams also co-chaired the Ebony Fashion Fair from 1972-1974, a traveling fashion show that raised millions since its founding in 1958 (the Bellevue Arts Museum has an exhibit on the 50 years of the Ebony Fashion Fair showing through August 14th). 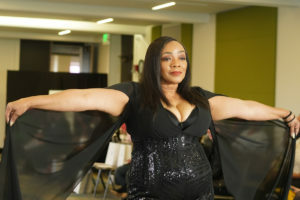 She estimates she currently sits on 13 committees, ranging from organizing the recent 34th annual Juneteenth celebration, to the Central Area Collaborative, a newly formed group of organizations and community members working towards preserving the African American cultural legacy and supporting small businesses in the Central District. 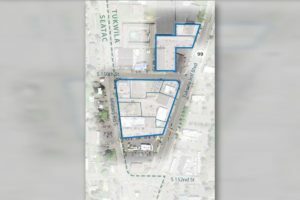 Williams is also involved in a needs assessment and mapping process of small businesses in the area, which she hopes will ultimately help attract more customers. Williams’ landmark building in the historically African American Central District is now, strikingly, surrounded on all sides by development. In the shadow of pervasive construction and mid-rise structures, it’s a last holdout on the Madison strip. It’s no coincidence that she’s still here. Williams believes that, in addition to technical assistance, access to capital and property ownership are key to sustainability for small and micro businesses like hers. But Williams says that ever since she bought her property, she’s had her share of trouble with developers interested in acquiring it. It’s not just Black-owned businesses that have felt the pressure. Courtesy Tire, which operated next door to DeCharlene’s for nearly 50 years, closed in December 2014 after the building was sold, and the business was unable to find a new space anywhere nearby. 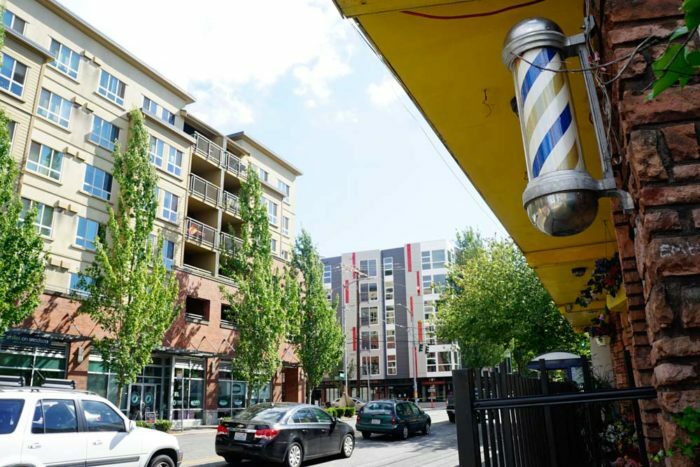 Jeremy Johnson, manager for over 13 years, says that commercial spaces suitable for auto shops simply gave way to condos, small boutiques, and retail that comes with mixed-use development. Across East Madison from DeCharlene’s shop stands a six-story complex built in 2004 that houses a Safeway and Starbucks, and “The Summit at Madison Park” apartments, with tiny 454 sq. ft studios currently starting at $1,345 a month. 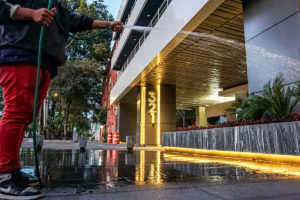 Its name was taken as an insult by many local residents and business owners, including Williams, who felt it was a disrespectful attempt to rebrand the residences as separate from the Central District and associate them with Madison Park, nearly a mile away. Across from Safeway on 22nd, at the former site of Oscar’s II and the old Twilight Exit, sits a newer, nearly completed six-story mixed-use development for close to 100 high-end apartments. Jim Mueller, Managing Partner and CFO at JC Mueller LLC, and formerly a development director at Vulcan, is the driver of the development there. 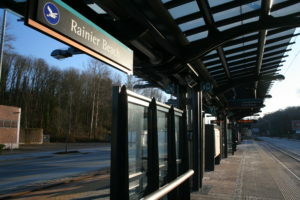 While at Vulcan, Mueller was responsible for the planning and development of nearly 30 blocks in the South Lake Union area. According to Williams, Mueller has also approached her in the past about buying her property. He didn’t follow up on requests for an interview for this story. The Courtesy Tire lot is also being developed by Mueller. It will soon be demolished and replaced with another six-story market-rate apartment building. And across East Denny Way, at the former site of Deano’s and Chocolate City, a six-story, 222 luxury apartment and retail complex styled as “Twenty20Mad” is under construction by one of the largest developers in the country, Miami-based Lennar Corporation (also behind West Seattle’s largest development, The Whittaker, with The Valdok in Ballard and a development in Interbay also in the works). Williams has already personally felt the impact from the area’s development. 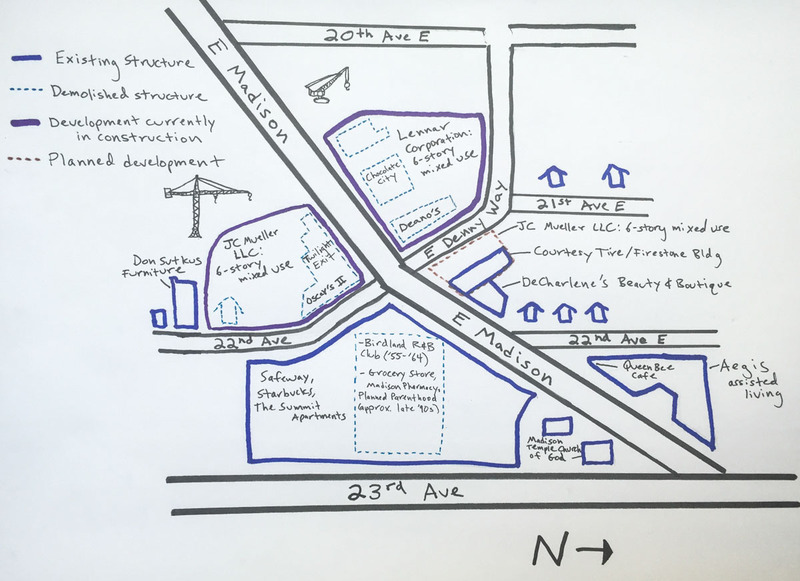 Adding fuel to the fire is the contentious 23rd Avenue construction project, running from Jackson Street all the way north to John. Road construction is currently clogging the roads right around DeCharlene’s business, and is expected to extend into early 2017. Williams agrees with many small business owners that it’s yet another factor speeding gentrification and displacement in the Central District. Although the City made modest federal mitigation funds and tax credits available after business owners protested, Williams says she didn’t apply because the City determined that only businesses located south of 23rd and E Union were most impacted. 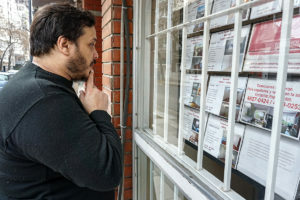 As market-rate housing and high-rent retail attract increasingly wealthy and white residents, what will be the future of Black businesses? Williams, for one, does not intend to give way easily. So how can residents, new and old, help longstanding small businesses in the Central Area thrive? Clarification: this post has been updated to clarify that the Ebony Fashion Fair exhibition at the Bellevue Arts Museum is a 50 -year retrospective, and not an anniversary. Tags: Central District, Central District Seattle, Chloe Collyer, Cynthia Brothers, DeCharlene Williams, development, East Madison, fashion, gentrification, Ian Eisenberg, Jim Mueller, Seattle gentrification, Uncle Ike's. DeCharlene is a Seattle Treasure. DeCharlene Williams pass away, she will be truly missed. Praying for her family, during this time of loss. I thank God that she didn’t give up. Just like the poem Footprints it then I carried you. The songwriter stated everyone touch is a song. God sent her to one of the most racist cities in the world and yet she lived to tell what everybody did to her. Now they need to find a place for her name to be etched in the streets or highway leading to her business. Thank you DeCharlene for loving us when some were to selfish to love you back.